Vol. IV, 4 of the C.P.E. 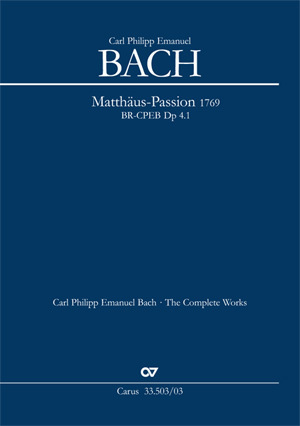 Bach Complete Edition, edited by the Packard Humanities Institute The series of C.P.E. Bach’s 21 Hamburg Passions begins with an exceptional work. No other Passion of Bach’s is as unusually ambitious as his first work in this genre; and none of his other Passions has such a high proportion of original compositions by C.P.E. Bach himself; only the chorales and a few turba choruses were written by his father. The only Passion by Bach’s son, his setting of the Matthew Passion of 1769 is a full-length work. ... eine Beschäftigung mit dem erst in jüngster Zeit (wieder-) entdeckten kirchenmusikalischen Werk C. Ph. E. Bachs wärmstens zu empfehlen.